From board rooms to classrooms to lecture halls, Willie Weir entertains, motivates, and inspires. 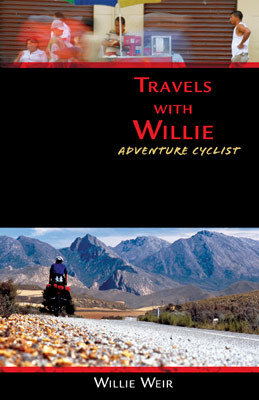 Thanks to great sponsors, Willie Weir gets to road test the best cycling gear for long distance adventure touring. 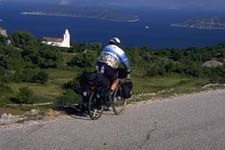 Willie Weir cycling in Slovenia on a Rodriguez mountain bike and Ortlieb panniers. The bicycle frame comes apart with S-S couplings for easy travel. Willie rode a Rodriguez mountain bike through 5,000 miles of rugged terrain in the Balkans. After another 3 years, it's still his bike of choice for navigating the city streets of Seattle. The Rodriguez supplied by R+E Cycles is a keeper! Willie's on a Rodriguez, Kat is on an old clunker, and loved to complain about it. After Willie introduced and converted his fiance, Kat, to cycling touring in the Balkans, R+E knew they had to get the two of them on one of their tandems. Who better to test ride the Rodriquez 8-ball than their favorite adventure cyclist? The 8-ball is a single bike that converts to a tandem in under a half an hour. 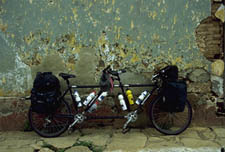 R+E gave Willie and Kat the perfect vehicle for Willie to travel to Cuba, ride the Pinar del Rio region solo, then meet Kat with the tandem inset at the airport. Taxi drivers assured of a big fare getting them and the large box into Havana, watched with astonishment as the box was unloaded and Willie's single bike converted to "el Tren"--the bicycle built for two. With a wave and cheer, the taxi drivers saw them on their way to discover the hidden truths of the forbidden land. 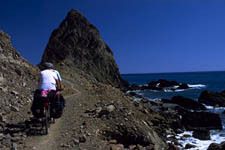 Willie and Kat ride the Rodriguez 8-ball along the Pilon coast road in Cuba. One of the key features in both Willie's Rodriguez mountain bike and the 8-ball tandem is the S-S coupling system. The couplings make it possible to unscrew the frame of any bicycle, better for packing into tight places...or converting a single into double. And cycling touring, or the trip to the produce market wouldn't be complete without the Ortlieb waterproof panniers. Ortlieb USA sponsored the full touring bags for Willie Weir, and after 10,000 miles, they still keep the rain out. Extra bonus--Waterproof rolltop panniers can double as a washing machine while on the road. Just add soap, water and dirty cycling clothes, roll down the top and give it a big shake. A big thumbs up to Ortlieb panniers.